Asparagus is loaded with good nutrition. It is a good source of fiber and protein, and essential for good digestion and immunity. It also contains a number of anti-inflammatory compounds, antioxidants for anti-aging, vitamin K for healthy blood clotting and bones, vitamin B for stable blood sugar level, vitamin A for better eye sight and potassium for kidney function. 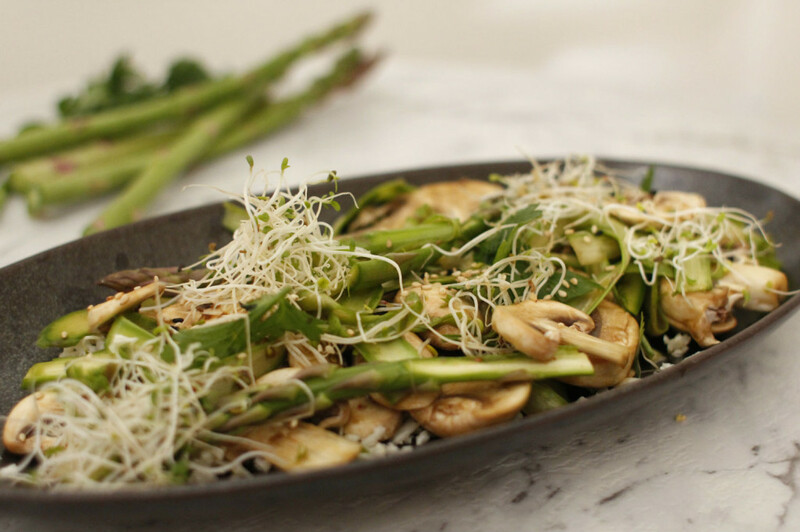 Glutathione in asparagus is a detoxifying compound that helps break down carcinogens and other harmful compounds like free radicals. It contains high levels of the amino acid asparagine, which is a natural diuretic and fantastic for fluid retention in some people. This recipe is using marinated raw mushrooms, but if you don’t like the taste of raw mushrooms, feel free to lightly grill them instead. Grate cauliflower using a box grater to make a cauliflower rice. Wash and shave asparagus into thin strips. Wash and roughly chop parsley. Marinate thinly sliced mushrooms in coconut amino sauce, salt and pepper for 10-20 minutes. 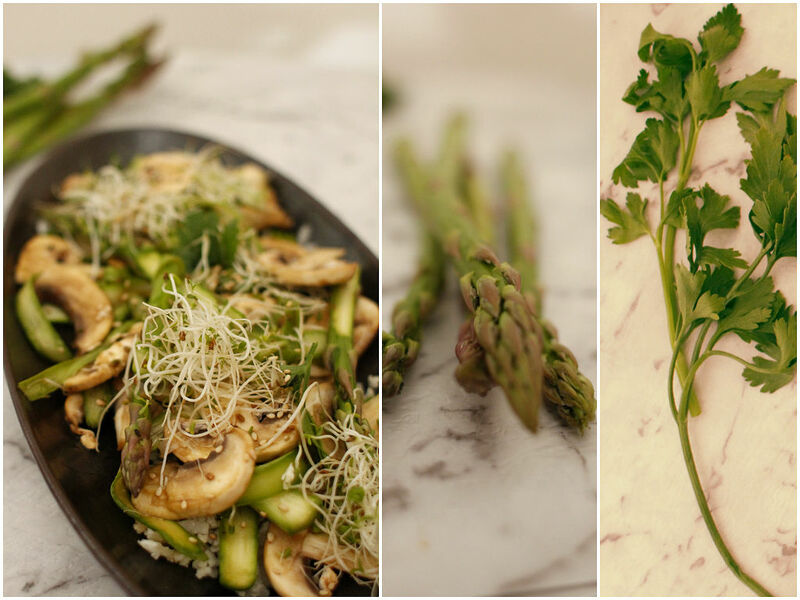 To assemble, gently toss marinated mushrooms, parsley and shaved asparagus, put over the bed of cauliflower rice. Garnish with alfalfa sprouts and sprinkle sesame seeds. Drizzle more amino sauce if you desire.